Can anyone guide me what is the solution to this problem (to display next button on edittext)? Add android:singleLine="true" android:nextFocusDown="@+id/textView2" on your xml. Will show Next key and also focus to the next field. In your layout, just set the XML attributes android:imeOptions="actionNext" for your first three text boxes and android:imeOptions="actionDone" for the last one. If your EditText is supposed to have only 1 line, add the attribute android:singleLine="true" on your XML, that will remove the Enter key and replace it with Next / Done button. 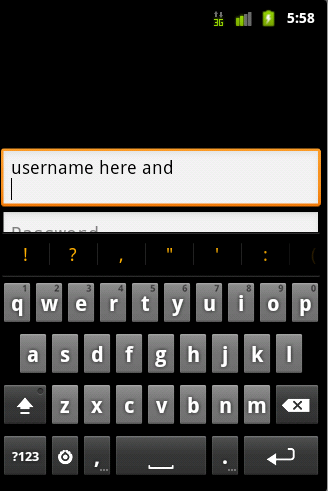 Just add android:singleLine="true" to the EditText tag in the layout XML..
line in your edittext tag. and your problem will be resolved. Add android:nextFocusDown="@+id/tv2" on your XML. Don't add android:imeOptions="actionNext", otherwise it will override above two attributes. Android Move cursor from one EditText to another one if click any letter in field?